One of the difficulties for students who want to learn to read and write the Thai Language, is the need to understand about the three groups of Thai consonants. These define the tones, the pronunciation and the correct way of writing. As a Thai Language Teacher, it is difficult to explain how very important this is. There is no particularly easy way to learn this, other than practice, practice and more practice. What are the three Thai Consonants? They are the three types of script that comprise the Thai Alphabet. The three groups of consonants consist of Middle consonants, High consonants and Low consonants. 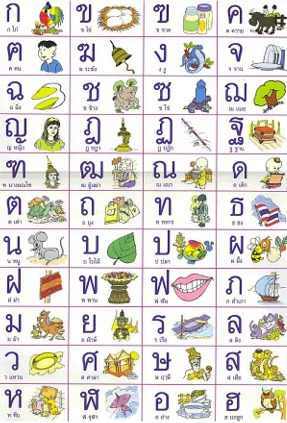 For example ..
Picture of the Thai Alphabet below.